I'm going to do this blog with a Left Hand border orientation. See how I like it. Yesterday I had quite a fun day with a friend. She drove with me to a brief doctor's appt., and then we had breakfast at "The Egg and I". They must be a franchise, as I know of three ones in the Denver/Estes Park areas that are owned by 3 different people. If you have never tried one before, I would highly recommend them. Even if you don't like eggs! Their 'Waffle Eggspress' is super, and you don't have to order eggs with it. They also have tasty soups and good sandwiches. My favorites are the Wisconsin Scramble (3 kinds of cheese) and the Athena Scramble (feta cheese, portabello mushrooms, diced tomatoes and asparagus! )And yes...my absolute fave is their waffles!! After our breakfast, we visited 'Unique Thrift' at 88th and Sheridan in Arvada, CO, USA. Nice thrift store. I always find things there, clothing wise. I found this pretty, floaty top at www.acornonline.com, on sale for $63.00. The one I purchased is similar, only it has more fabric, with a drapey type front instead of a stitched front, and it is longer in the back. The sleeves are not as obvious as the blouse above. Similar gorgeous floaty material. My cost: $4.99. 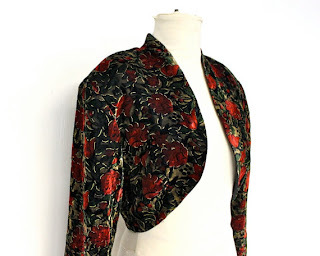 This is a blouse from www.RebeccasVGVintage.com for $27.00. My very similar one was $6.99. You can find this slinky knit at www.calison.com for $18.00. 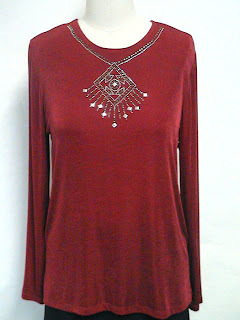 My slinky vivid burgundy knit tunic has a gorgeous all over Asian style leaf pattern done in black. It is stunning! Cost for my Virgina Gray label top - $4.99. 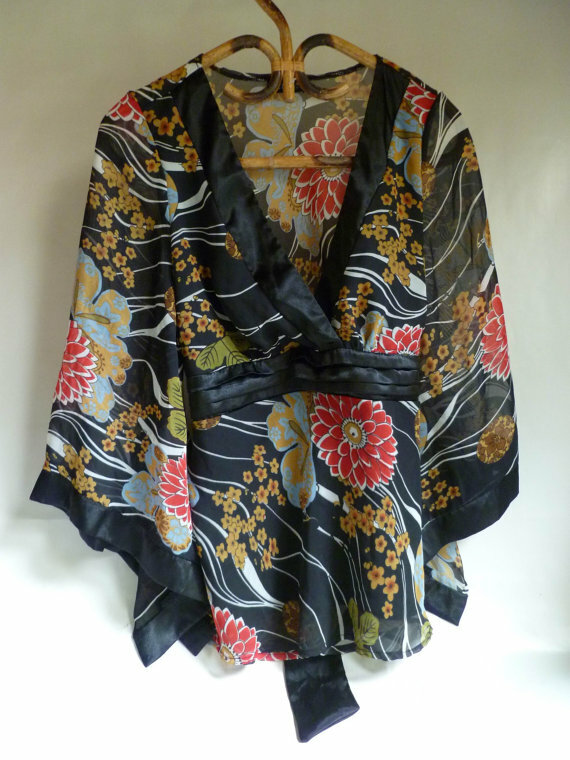 Not sure if this one is silk or polyester like me. The end looks are similar. You can find this one at www.beforeafton.etsy.com with a Jones NY label for $34. Mine is polyester, but oh-so-silky slick; it has beautiful Asian-style embroidery pinks design on black. Mine is tunic length, and the sleeves have a black border at the ends like the one above. My price: $5.99. I had a hard time finding a good 'similar' for this next shirt. This one you can find at vince-neiman-marcus-longsleeve-shirt at www.shopstyle.com on sale for $78.00. Mine is a heavy duty cotton, with two pockets (not Western style however) and sleeves that have no wrist band. Perfect for folding up a time or two. Mine has heavier very stylish antiqued silver buttons. My cost: $12.99. Mine is also a red muted plaid, which I think is more in fashion. You can find this poly/cotton blend tie front jacket for $25.00 at www.Oldnavy.com. Mine is made from the slinky, travel knit type fabric found at Coldwater Creek. In fact, I have seen the exact jacket that I purchased in Coldwater Creek catalogs. (Oh, I drool on those catalogs....). Their prices are around $79.95 - $89.95 for a slinky knit simple jacket. If you aren't familiar with slinky knit, or Travel Knit (there are other names, but they are all the same basic fabric) you are in for a treat. If you travel, these are a MUST. You roll them up, put them in your suitcase, and can unroll them 7 days later (or more), give it a shake and it is ready to wear. No ironing. No fussy packing. No worries! I also store all of my travel knits rolled up in the drawer. My thrift store cost: $4.99. 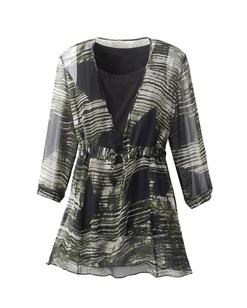 This blouse has a sheer overlay, while mine doesn't. It is cut similar. Mine has embroidered-in-gold diamond shapes along the front v-neckline and down a panel to the hem. Same v-neck for the back, with the same panel, but only the gold embroidered diamond on the neckline. The overall color is a slinky blue, not quite navy. It is a very flattering fit to us of that have (shhh.... a tummy!). This one you can find at CWC for $80.00. Anyone that knows me knows I have 'a thing' for Mickey Mouse, and the Disney Resorts (DisneyLand and Disney The Magic Kingdom). 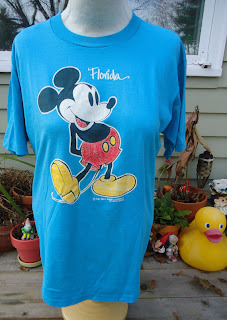 If I can find a Disney shirt/t-shirt/socks/rubber stamp/paper/etc. I am oh so happy! The above t-shirt is not as nice as the one I purchased, but it had that nice blue background so I have included it. You can find that one at www.lilmissthrify.com for $29.00. About right for a vintage MM t-shirt in excellent condition. This is perhaps my favorite purchase. Mine is a solid deep burgundy velvet, with little kind of ironed-on appliques on the upper areas, right and left, in burgundy thread. It looks like it has been hand-embroidered and hand-beaded, but when you get really close you see it is not. 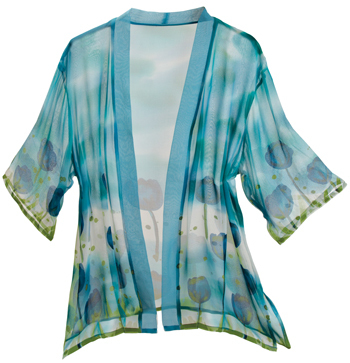 It has one single faceted button at the top, the rest of the bolero hangs free. Beautiful long sleeves that are actually long on me! (I have long arms, so my wrists tend to hang out like a scarecrow's in most long sleeves). My thrift store purchase: $9.99. This is a knit-woven top found at CWC for $70.00. Mine is a lightweight chambray cotton fabric with a Miley Cyrus label. 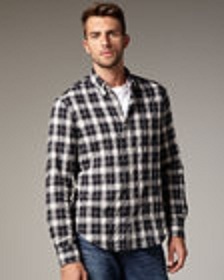 It has little ties that go around the back, with long sleeves that roll up to be buttoned like the one in the picture. Mine has a collar with a band that is sweetheart shaped down to the buttons. I paid $3.99. You'd think I had enough already, but no, there's more! 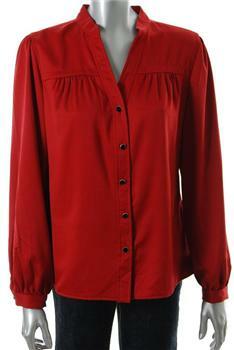 This is a crossover, 3/4 length sleeve blouse from CWS for $60.00. Mine has a side-wrap faux look like this one, with pleats under both cup areas. (I have no idea what the actual word for that is - I'm sure there is one somewhere!) The effect is rather like a sarong skirt hanging from the bodice. Mine is a cotton blend, cap sleeves, with very light pink flowers added to a background of black with white line flowers. I also picked up a nice basic long sleeve top, 100% ribbed cotton with a White Stag label. It has a little crochet embroidery around the relaxed neckline. Very pretty, very clean, in good (maybe like new) condition. My price: $2.99. Okay, this last purchase of mine is also the blouse that I just could not find anything similar to the one I bought. Using the above blouse (found at www.ebay.com Charter Club retail price $55.00) as kind of a base, let's add and remove some details. First, let's remove the collar, and the pleats under a top yoke. 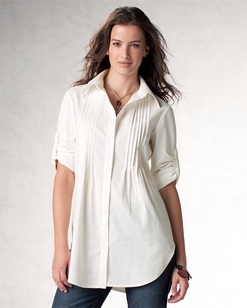 Mine is just a straight falling blouse with no yoke; and add a pointed classic collar. Next, lengthen the sleeve cuffs to 2 1/2" long. The single button is at the sleeve side (not the hem side). That leaves the rest of the cuffs to give an almost bell-type sleeve ending. Soooo cute, and long enough too (see scarecrow remark above). Now, ditch the frumpy looking fabric. Mine is 'crinkled' all over. So flattering, if it's not too tight. DO NOT WEAR TIGHT CRINKLE SHIRTS. YOU WILL LOOK LIKE A LARGE BEACHED WHALE WITH A SKIN CONDITION. REALLY. I can say this with decades of experience of people-watching, and my own mortification and then fall down laughing fit in a dressing room wearing one of the above named garments. 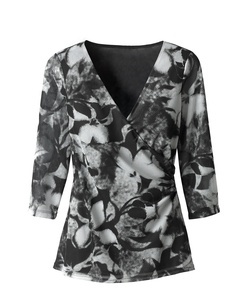 Last, change the print to a stunning black, with burgundy lace and white lace all-over print. Yeah, hard to describe, and was equally hard to find anything like it online. My apt 9 label price: $5.99﻿. At the end of my shopping spree, I had spent LESS than I would have purchasing two items I wanted from Coldwater Creek! I ended up with 13 wonderful tops, and a book about the decimation of Tigers in the wild, with lots of photos. Don't get me wrong. I am sure I will save my money and continue to purchase certain wardrobe basics from Coldwater Creek. They are a great investment. Okay, I'm done bragging for the day. I hope you have gotten out of this little blog entry an appreciation for second-hand and thrift store prices, compared to full price retail, and even to sale priced regular retail! When my sister first started visiting her husband's family in Chihuahua, Mexico, she brought beautiful prom-like dresses for his sisters, aunts, nieces, etc. Santiago was very unsure about this, as second hand was not a good thing in Mexico. He had always brought only new things to his family from the USA. Check out your local Junior League thrift stores for some nicely run second-hand stores. I also like the ARC store in Broomfield, CO, USA. The ARC supports adults with development disabilities by giving them jobs (with pay) and lessons on self esteem, how to live on your own, social interaction, etc. Consider going on a treasure hunt for yourself!